After a day of hiking or swimming, Adam Sappington of The Country Cat in Portland, likes the simplicity of cooking a one-pot meal like this for his wife and their two young sons. "Gramma" is the perfect tool for checking the meat's tenderness. Prepare beef: In a bowl, combine garlic, rosemary, oil, 1 tsp. salt, and 1/2 tsp. pepper. Rub all over beef and pack in a resealable plastic bag. Chill up to 2 days, or freeze. Prepare vegetables: Put tomatoes, corn, and onion in a resealable plastic bag and green beans and zucchini in another; chill up to 2 days. Don't chill potatoes. 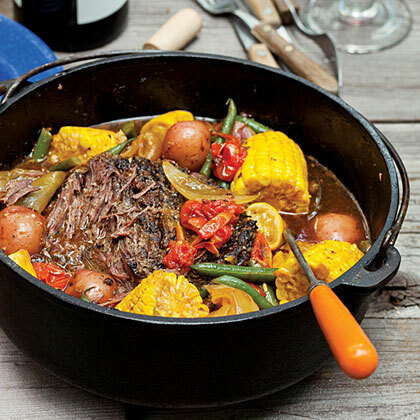 Set up a fire for top and bottom dutch-oven cooking (see "How to Use a Dutch Oven," below). Put a 4- to 6-qt. cast-iron camp dutch oven in place, add butter, and melt. Add beef; cook until browned on underside, 10 minutes. Turn meat over, add 2 cups broth, cover, and arrange coals on top of pot. Add fuel now and every 30 minutes (see "Start Cooking," below) and cook 1 hour. Turn meat over, add 1 cup broth, vegetables with corn, and the potatoes; cook, covered, 1 hour. Turn meat and corn, add beans and zucchini, and more broth if pot is getting dry; cook, covered, until meat is very tender, 15 to 30 minutes. Season with more salt and pepper to taste.